When it comes to economic freedom, the numbers tell a very consistent story, although it is a story that remains underappreciated to this day. Indeed, in the years since the financial crisis of 2008, the free market has taken a beating in the marketplace of ideas. Yet the simple fact remains that the more economic freedom a government leaves in the hands of its people, the better off those people are, not only in terms of basic material well-being, but also in terms of social and individual indicators of human well-being—things like health, education and happiness. This is true whether we compare different countries and regions with each other, or whether we compare them across time. This Economic Note provides a brief overview of economic freedom around the globe. It then looks at some of the numbers that demonstrate the strong, positive effects of allowing people greater freedom to interact among themselves in the market. Economic freedom makes people wealthier. As it has expanded over the past two decades, with the world becoming “moderately free” overall, real global GDP has risen by approximately 70%. Meanwhile, the proportion of the global population living in poverty has been cut in half. (8) This means that literally hundreds of millions of people have climbed out of poverty over the past twenty years, thanks at least in part to growing economic freedom. Comparing countries, it is clear that individuals living in places with more economic freedom tend to have substantially higher average incomes. 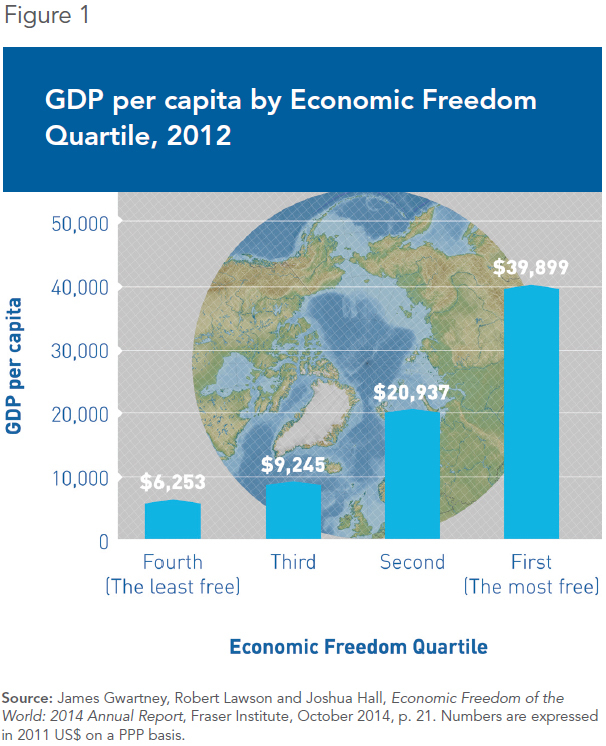 The most economically free 25% of nations had an average per capita GDP of $39,899 in 2012, compared to $20,937 for the second freest quartile, $9,245 for the third freest quartile, and $6,253 for nations in the bottom quartile(9) (see Figure 1). As for poverty, the share of income earned by the poorest ­10% of a country’s population is uncorrelated with economic freedom. 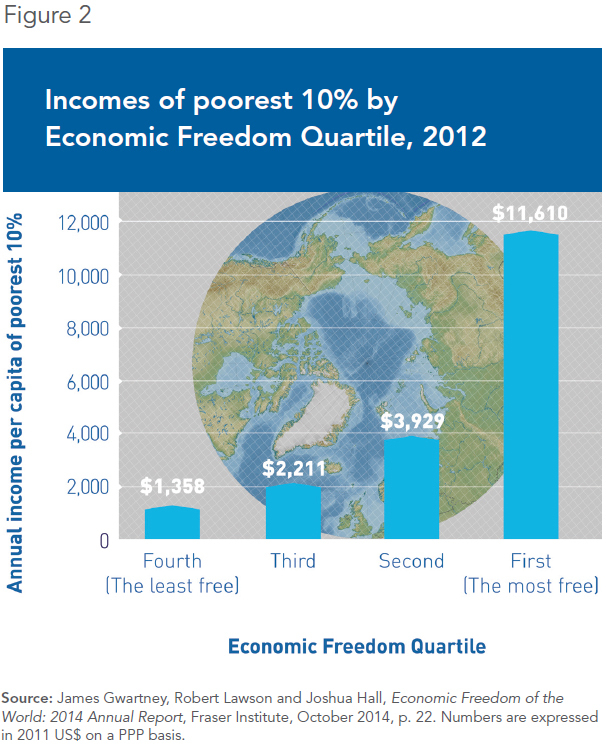 The poorest 10% earn around 2.5% of GDP regardless of how free a country is. (11) Of course, given the strong positive correlation between economic freedom and per capita GDP discussed above, the poorest 10% who live in the freest countries are much better off in absolute terms. They enjoy average incomes of $11,610, compared to $3,929 for countries in the second freest quartile, $2,211 for the third freest and a mere $1,358 for the least free quartile(12) (see Figure 2). Clearly, the poor living in a country with a decent amount of economic freedom are better off than those living in a country that is less free. It is impossible to talk about changes in the global poverty landscape without at least mentioning that China and India, the two most populous nations on Earth, have been growing a lot less poor. 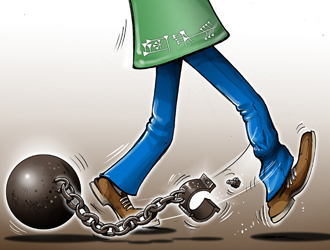 Although they remain relatively unfree, with neither of them breaking into the top 100 on either index, they have become considerably freer than they used to be, especially in terms of trade freedom. China’s EFW score climbed from a dismal 3.74 in 1980 to a much better 6.20 in 2012, while India’s score rose from 4.50 in 1975 to 6.65 in 2012. (13) It would be hard to overstate the importance of the changes that have occurred in these two countries, allowing a staggering number of people to live substantially better lives than their parents did. Beyond the basic material comforts that come with high and rapidly growing per capita incomes, there are other, social indicators like health and education that are very important to human well-being. The available data show that these, too, are positively correlated with economic freedom. This should hardly be surprising given the correlations discussed in the previous section, since among the things that money can buy are hospitals and schools. This might simply be due to the high correlation between EFW scores and GDP per capita. After all, money may not buy happiness outright, but it is reasonable to expect it to have some influence on life satisfaction. (20) Indeed, per capita GDP does have a considerable impact on life satisfaction. (21) But even after controlling for income levels and other socio-economic variables, positive effects on life satisfaction remain. (22) It seems that people value freedom not only because it makes them richer, but also because it makes them free. But there is still room for improvement, even in the freest countries. We would all be wealthier, healthier, more educated and happier if the governments of industrialized and industrializing nations alike were to take heed of the data, and move more quickly and consistently in the direction of greater economic freedom. 1. James Gwartney, Robert Lawson and Joshua Hall, Economic Freedom of the World: 2014 Annual Report, Fraser Institute, October 2014. 2. Terry Miller and Anthony B. Kim, 2015 Index of Economic Freedom, The Heritage Foundation and Dow Jones & Company, Inc., January 2015. 3. James Gwartney, Robert Lawson and Joshua Hall, op. cit., footnote 1, p. 1. The IEF, for its part, emphasizes three fundamental principles of economic freedom that touch on similar themes: empowerment of the individual, non-discrimination, and open competition. Terry Miller and Anthony B. Kim, op. cit., footnote 2, p. 11. 4. James Gwartney, Robert Lawson and Joshua Hall, op. cit., footnote 1, p. 15. 5. Terry Miller and Anthony B. Kim, op. cit., footnote 2, p. 70. 6. Ibid., pp. 4-9; James Gwartney, Robert Lawson and Joshua Hall, op. cit., footnote 1, p. 8. 7. Terry Miller, Anthony B. Kim and Kim R. Holmes, 2014 Index of Economic Freedom, The Heritage Foundation and Dow Jones & Company, Inc., January 2014, pp. 31-32; James Gwartney, Robert Lawson and Joshua Hall, op. cit., footnote 1, p. 15. 8. Terry Miller, Anthony B. Kim and Kim R. Holmes, ibid., p. 50. Real global GDP in 2005 US dollars rose from $31.7 trillion in 1993 to $53.7 trillion in 2012, an increase of 69.4%. The percentage of the global population living in poverty fell from 43% in 1990 to 21% in 2010. 9. James Gwartney, Robert Lawson and Joshua Hall, op. cit., footnote 1, p. 21. Figures in 2011 US dollars at purchasing power parity (PPP). 11. James Gwartney, Robert Lawson and Joshua Hall, op. cit., footnote 1, p. 22. From freest to least free by quartile: 2.78%, 2.23%, 2.41% and 2.48%. 14. World Health Organization, Global Health Observatory, Life expectancy. 15. James Gwartney, Robert Lawson and Joshua Hall, op. cit., footnote 1, p. 23. 16. The education component of this value is based on measures of average actual years of schooling for 25-year-olds and expected years of schooling for children of school-entering age. 17. Khalid Malik, 2014 Human Development Report, Sustaining Human Progress: Reducing Vulnerabilities and Building Resilience, United Nations Development Programme, 2014, p. 167. 18. Terry Miller, Anthony B. Kim and Kim R. Holmes, op. cit., footnote 7, p. 26. 19. James Gwartney, Robert Lawson and Joshua Hall, op. cit., footnote 10, p. 224, Figure 4.4. 20. Betsey Stevenson and Justin Wolfers, “Subjective Well-Being and Income: Is There Any Evidence of Satiation?” American Economic Review: Papers & Proceedings, Vol. 103, No. 3, May 2013, pp. 598–604. 21. James Gwartney, Robert Lawson and Joshua Hall, op. cit., footnote 10, p. 223. Yanick Labrie is an Economist at the Montreal Economic Institute, Bradley Doucet, an Editor and Policy Analyst at the MEI. ▪ Just Cause, or Just 'Cause?